With nearly 200 licensed wineries and over 8,000 acres of vineyards, the Okanagan Valley is a dream destination for wine lovers. Each year, around 1 million visitors from all over travel to BC to visit the wineries. Whether you’re a wine expert always on the hunt for the perfect bottle or a wine lover looking forward to your next wine sampling getaway, the Okanagan won’t disappoint! Every Thanksgiving weekend, a bunch of us head to Oliver, about an hour and 20 minutes south of Kelowna, to stay at our friend’s rental place, free of charge—we call this annual event “Friendsgiving”. We spend our days touring the wineries and our evenings enjoying long dinners and playing board games, while sipping on the delicious wine we bought earlier in the day. This makes the perfect trip for friends! This picturesque wine country is the perfect backdrop for wedding photos. Many wineries will let you rent their space for these special occasions. Imagine saying yes to the love of your life, surrounded by family and friends, with a magical setting in the background. It doesn’t get better than this! And you’re guaranteed to have good wine served at your reception. While you’re at it, consider planning your stag or stagette party in the Okanagan. You can rent a villa close to the vineyards and have a wonderful time. Finally, the Okanagan region is also a great destination for road tripping with the whole family. You can plan a road trip and explore the beautiful region, driving from one gorgeous town to the next. With beaches, parks, trails, and fresh seasonal fruits and freshly-baked pies, the Okanagan will win over all ages. Make a few wine shopping stops during the day, and after you’ve put the little ones to bed, crack open a bottle and unwind. 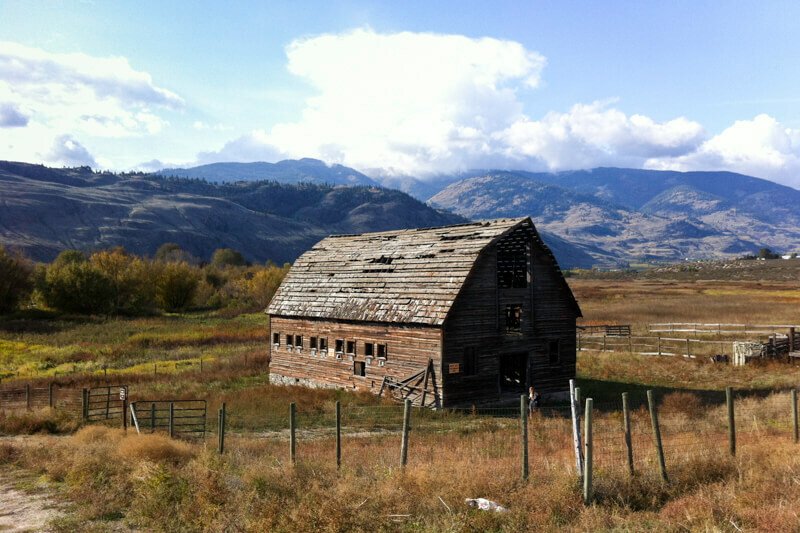 Driving through the Okanagan, we came across this abandoned barn on the side of the road. The Okanagan Valley has plenty of accommodation options for you: from classic hotels, to a house rental in a quiet town, or a Kelowna bed and breakfast winery where you can enjoy an all-inclusive experience. It’s just a matter of finding something that fits your budget and mood. The Okanagan is home to some of the best winery restaurants and offers many options for wine tour packages, so try to work those in your itinerary as well! The best way to explore the vast Okanagan region and cover more ground is to drive through it. Whether you plan to stop at a different town every day or stay in one place the whole time, you’ll need a vehicle to visit the wineries, as they’re not exactly within walking distance from each other. Sure, you could be adventurous and jump on a bike, but pedaling through rugged landscape with your bags filled with newly-purchased bottles of wine might turn out to be more dangerous than you think, especially if you’ve been drinking! Stay safe and save the trails for a cycling adventure another time. If you’re planning on visiting a lot of wineries—and there’s nothing wrong with that; after all, that’s what wine sampling is all about—make sure to have a system in place for a designated driver. You can take turns, draw straws or names out of a hat, just remember to keep the roads safe! You might only be sampling wine in small quantities, but speaking from experience, it’s easy to get carried away after a few wineries. Tip: Okanagan roads are windy and some of the wineries are tucked away! Don’t forget to get car insurance if you’re renting a vehicle. TuGo offers comprehensive insurance that covers you for damage to the rental car, as long as you’re sober while you’re driving! If you’d rather not have to worry about bringing a car, then book yourself an Okanagan wine tour with a local company. They’ll pick you up at your hotel and give you insightful information on the region and the different vineyards. It’s a good way to go all out on the wine sampling and while being able to relax between stops. 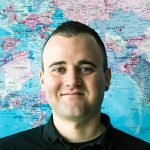 You may also want to splurge a little bit more and treat yourself to a more unique and memorable Okanagan boat tour or helicopter tour! 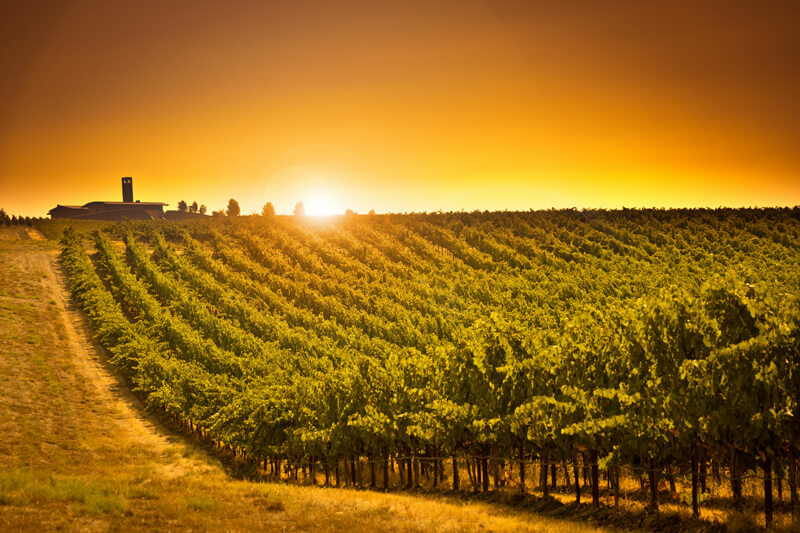 To help you plan your next trip to wine country, click on an area below to explore and read about the locations. You can also refer to this interactive map of wineries when planning your route, or look up their business information. Consider making Kelowna a home base for your Okanagan trip. The city is the third largest population centre in BC after Metro Vancouver and Victoria. Kelowna’s name comes from the native Okanagan term for grizzly bear. While you may spot some wildlife travelling through the regional and national parks, you’ll mostly find a wide variety of restaurants, museums, theatres, art galleries, one great symphony orchestra, and of course, many wineries. Take the car out of the city during the day to explore the vineyards, then take advantage of the dynamic cultural night scene in the evening by catching a show or visiting another winery right in downtown—some even turn into restaurants at night! Cedar Creek – One of the eight pioneering wineries of BC, Cedar Creek offers decades of wine-making experience, a panoramic view of the lake from the hillside, vineyard tours, a restaurant, and fun events such as yoga classes followed by wine receptions. The Hatch – Located in West Kelowna and overlooking Okanagan Lake and the mountains, the Hatch features a unique tasting room in an old barn that’s full of character. 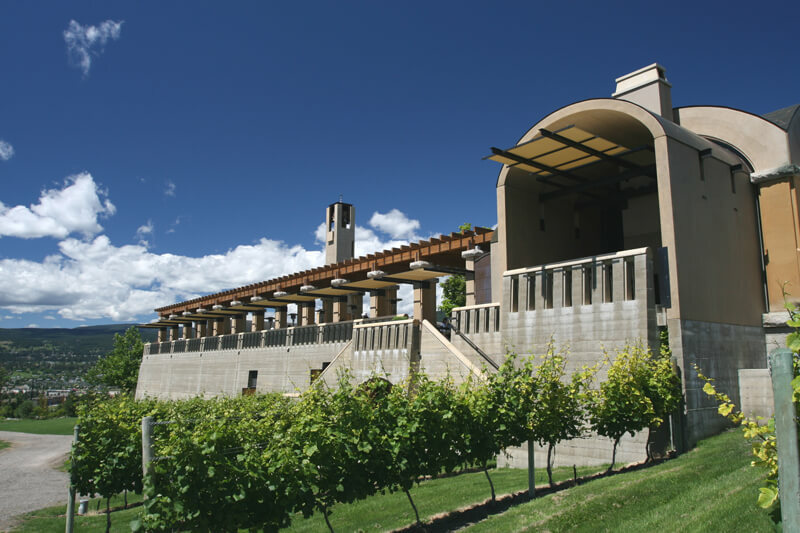 Mission Hill – This winery has unique architecture and a beautiful terrace restaurant where you can enjoy delicious dishes paired with wine, with the sun setting on beautiful Okanagan Lake in the background. They also organize cooking workshops and summer concerts to make a perfect activity for a friend’s getaway! 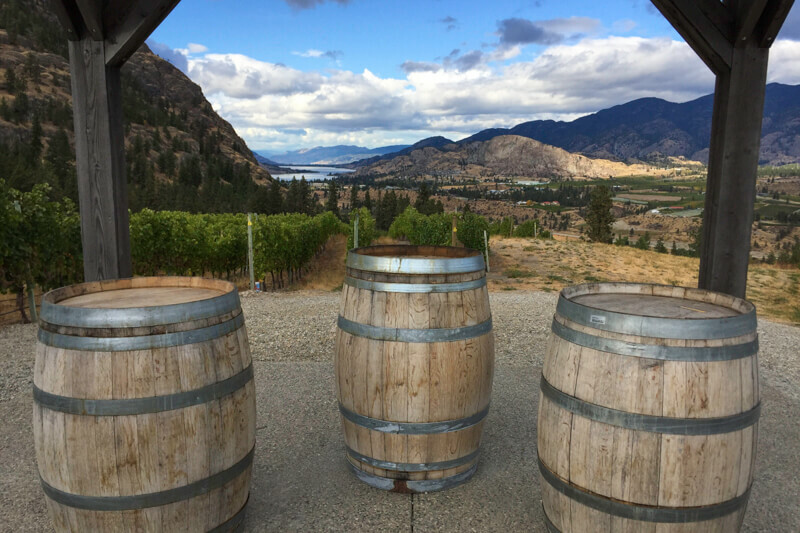 Mount Boucherie – Also situated in West Kelowna, this winery gives you the opportunity to enjoy food paired with wine on a patio with a beautiful view. The dry Riesling and the Reserve Syrah are the real stars here. Summerhill – Also known as Pyramid Winery for its unique geometric wine cellar, they pride themselves in producing quality organic Summherhill turns into a bistro in the evening and offers a wide range of local organic products. A great choice if you want to try a Kelowna winery restaurant! The unique architecture of Mission Hill Winery. The Okanagan Valley spans across several towns to the north and south of Kelowna. If you’re in the mood for a more quiet, relaxing getaway, stop at one of the many quaint towns of the region. They all share mild weather and gorgeous scenery, but are unique in their own ways, just like their wines. Just a few minutes from the US border, Osoyoos is home to the only living desert in Canada and is the hottest region in the country. Osoyoos Lake is said to be “the warmest freshwater lake in Canada” by locals. The different microclimates and soil variations allow for the perfect environment to grow grapes and other fruits. In fact, Osoyoos produces most of the grapes grown in the Okanagan Valley. But the small town isn’t only known for its wine, it also has sandy beaches, beautiful parks, hiking trails leading to the desert, and 18 golf courses! You’ll love driving through this Canadian version of Napa Valley. The town of Oliver, located near the south end of the Valley, might be small, but it’s labeled as the ‘Wine Capital of Canada’ by Tourism British Columbia. The town motto says it all: “Borne of the Waters, Blest by the Sun”. Indeed, Oliver is surrounded by many lakes, such as Tuccel-Nuit, Gallagher and Vaseux Lakes, great for canoeing or boating, and benefits from a semi-arid climate, perfect for grape growing. That’s why the town is bursting with wineries. In fact, 10% of Canada’s wineries are in or near Oliver! Adega on 45th – Colourful estate surrounded by vines, Adega combines the charms of Mexico and Italy. Sample some wine on their patio, with the dry desert surrounding you. Black Hills Estate – More modern-looking, this winery offers a good selection of whites, reds, and rosés. They also organize a lot of events, such as poolside parties in the summer and harvest banquets in the fall. Burrowing Owl – On top of producing great wine, they’re also a cozy guest house. Book yourself a night at this impressive winery and take a dip in their scenic pool. See Ya Later Ranch – Another amazing view! Take a stroll through their vineyards overlooking the valley. They have a store where you can find delicious products such as wine jam. Our incredible view from See Ya Later Ranch after a day of wine touring. These two towns located between Kelowna and Penticton are another great stop on your wine-touring trip. The climate there is similar to their southern neighbhours, though a bit less dry. Summerland is home to Giant Head, an extinct volcano dominating the town. You can hike it in about an hour. Both towns are home to decades-old wineries. Between them, take a break at one of the many roadside stands to enjoy fresh seasonal fruits and homemade pies. Dirty Laundry Vineyard – This winery with a unique theme is absolutely gorgeous! The red colours, the wood furniture and the plants hanging from the roof will make you want to spend the whole day there. Maybe it’s not such a bad idea? Fitzpatrick Family Vineyard – Sitting on the edge of a hill overlooking the lake, this winery has a beautiful interior and a scenic patio. Excellent for a relaxing meal prepared with seasonal ingredients and paired with a glass of sparkling wine, their specialty. They also craft cocktails featuring their star wine and local fruits. Lunessence Winery & Vineyard – Another spectacular view and very good wine. They even play classical music to their vines during growing season! 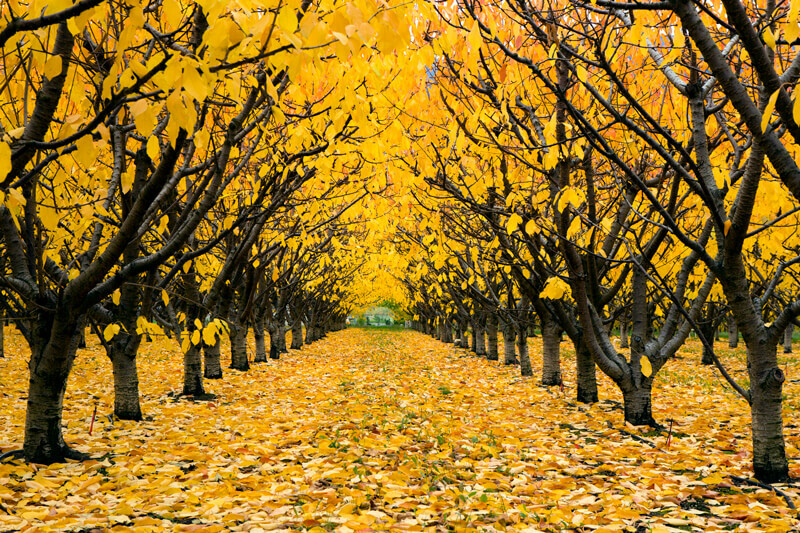 The colourful Fall foliage of the Valley’s fruit trees. Just outside of the city of Penticton, Naramata is a quaint village by the lake featuring waterfront cottages, sandy beaches, local artisans and of course, many wineries representing pretty much any wine that can be found throughout the Okanagan. While you’re there, make sure to rent a bike and follow the many trails that’ll take you on a mind-blowing journey. Black Widow – The building is beautiful. Go in the fall at sundown to admire the illuminated façade and the fountain. Daydreamers – A low-profile, hard-to-find, yet very charming little winery. Deep Roots – Drive up the hill for a panoramic plunging view of Naramata. Ruby Blues – What sets this winery apart besides the fantastic decor? The unique funky retro vibe! The sun setting over BC wine country. Now that you’re all set, pack a bottle opener and remember to get travel insurance if you’re visiting from out of province or abroad. You never know what can happen, especially when you’re drinking wine. Have a fantastic trip visiting our beautiful local wine country!